We are excited the fall season is upon us. The first sign at our quilt store that fall has begun--- the arrival of the Quilt Sampler magazine last week! Make sure to come grab your copy from Quilt Mercantile and enjoy the 20% off retail on books, patterns and magazines that we have given since opening our store. At this wonderful time of year when kids go back to school, the leaves change color, and the temperature cools off---we get excited because there is another milestone to celebrate. This year marks 14 years of being open! A special "THANKS" goes out to each of you that continue to support our store through this great journey. 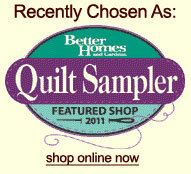 We continue to offer items high on every quilter's priority list---top of the line products. We have Elna sewing & embroidery machines, Handi Quilter longarm quilting machines & sit-down units, longarm notions & rulers, Hobbs batting by the inch, Gutermann cotton threads, Hemingworth embroidery threads, numerous quality cotton fabric lines (over 3,100 bolts), hand dyed wool by Wooly Lady, notions galore, books, and patterns. It continues to be our goal to have the best prices in a retail store where you can come to use machines, touch the fabric, and let Vickey help pick fabrics for your next treasured quilt. Handi Quilter has a Founder's Day Celebration with special pricing September 9th-22nd, 2016. Send us an email or give us a call for the details. The Quilt Mercantile demo machines are priced to save you money! We have four models in our store---we encourage you to come take a test drive. We have the Infinity w/pro-stitcher, the Avante w/pro-sticher, the Sweet Sixteen sit-down unit, and the Simply Sixteen in our store ready to come home with you. During the month of October we will have the VERY POPULAR Fancy Forest quilt made by Elizabeth Hartman. She is sending us this quilt and her Preppy Pod quilt featuring whales. We hope you can come to see them during the month of October. Below are the classes we have scheduled in the quilt store. Below the day classes we have a list of retreats. A little over five years ago, Jennifer and her husband Deven opened a retreat center directly behind the quilt store (Quiltagious Quarters) so you can come have fun and learn for a whole weekend. We strive to be your destination next time you want to learn a technique, pick out fabrics for a project, or spend a weekend sewing with your friends. Join a scheduled retreat or book your own. Basic Embroidery Machine class by Brenda Jeschke Sept. 22nd for $45. She will teach you how to use the embroidery part of your sewing machine. ANY BRAND! This class covers: using the proper stabilizers, how to hoop properly, discuss needles, threads, bobbins, machine, downloading designs from the internet, and designs organization on your computer. Bring your machine and laptop for hands on instruction for your machine. Now is the time to learn to use your embroidery machine! She has many samples to show and inspire you to use your embroidery machine in your own quilting projects. Long Arm Quilting Club Meeting September 24th, 2016. This club's goal is to bring together long arm quilters in our area. Club is open to everyone--any brand long arm on table or sit-down units. Just trying to decide IF you want to be a long arm quilter--join us on club day. We want to educate, share ideas and have fun. Jackie Brown is our lead educator for this club. (Jackie has just won-Best machine quilting and first place and best of show Pennsylvania Quilt Odyssey 2016. She also won two best of show and first place West Virginia Quilt Festival 2016 awards.) At 9:30 we will begin with a Show-n-Tell so bring any project you want to share. At 10:00 Jackie will begin her discussion and demonstration of her featured ruler and favorite rulers by Handi Quilter. She will demo the HQ Wave F template. You will learn how to stitch curvy crosshatching, a fancy ribbon design and a stitched flower with this 8 inch tool (20% discount on the new featured ruler on club day. If you want any held for you please send an e-mail). Club day is Saturday September 24th from 9:30-12:30. Cost is $20 per meeting per person. ***Want hands on experience? *** Jackie is offering an afternoon class to work on a background fill with continuous flames to add motion to your projects using the Wave F template. Class is from 1:30-3:30 for $35 per person. The afternoon is class limited to six students. Sign up now. Off-The-Block applique class by Pearl October 20th, 2016 from 9:30-4:30 for $55. "The" Pearl Pereira of P3 Designs is coming (from California) to the Quilt Mercantile classroom. She will be available for a one day class teaching her method using freezer paper for perfect shapes and starch to bend the fabric into that perfect shape. We currently have space in the class but it usually fills quickly. Project is fish block picture below. Hoopsisters Elegant Elements EmbroidaBlock classes. Pam Hansen leads a group that meets on the third Saturday each month and the 1st Wednesday of each month. Our sample is pictured on the above. Put your embroidery machine to work making this striking project where each block is quilted on your embroidery machine. Join the club and receive your designs monthly. Sit-down quilting unit basic free motion class Wednesdays 9:30-3:30 for $150. In this Class you will learn how to move the fabric with the speed of the needle to get even stitches. I will teach you how to cross hatch, stipple, basic feathers, background fills, and how to us the quarter inch thick rulers. October 2016--P3 Designs off-the-block applique retreats. We are taking names for the backup list. 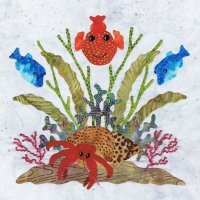 Pearl will also teach a day class October 20th for those of you that wonder if her method might change your mind about applique! See information above. Tuffet Retreat taught by Sylvi Sealy January 20th-22nd, 2017. The designer of the hottest new project from Houston Quilt Market and Festival 2015, Sharyn Cole, praises Sylvi as "The Best certified instructor in Texas!" We are bringing her AGAIN to Celeste, TX to teach you to make your own tuffet in a weekend. This is an awesome opportunity to learn from the best! Sylvi helped students make over 550 tuffets last year. Check out her Facebook page: sewcolorfulquilts In preparing for this retreat offering I have learned that not all tuffet classes are created equal. Sylvi uses only the best quality tuffet kit so your masterpiece will be a useable family heirloom for many years to come. She provides absolutely everything you need to finish your project while you are here...Yeah! (no UFO will be added to your stash!) Several ladies at our July retreat finished two tuffets and a matching tuffet pincushion. Alice Wilhoit A-Z Retreat March 23rd-26th, June 22nd-25th, or September 7th-10th, 2017. Alice is a published author that teaches all over the United States. We are fortunate to have her in our area. Need help to finish or get motivated on one or more of your UFO's? Alice says this retreat is for you! Drag out those unfinished projects! You know, the ones you put away because you were stuck. Sign up for a retreat with Alice and get the help you need to complete those projects. Or just start something new. Alice has over 25 years experience as a teacher. She is an author, pattern designer and is very knowledgeable with appliqué, embroidery and crazy patchwork. 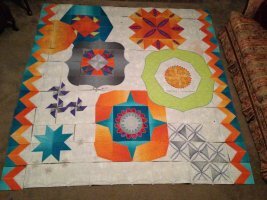 Jackie Brown Machine Quilting Retreat May 19th-21st, 2017. The retreat is for domestic sewing machines and sit-down long arm units. Jackie will demonstrate multiple techniques. She is very excited to show domestic machine owners how to use long arm rulers with the new ruler feet we have available for most types of sewing machine (Janome and Elna we definitely have the ruler foot for your machine). You are sure to have seen quilts at our DFW quilt shows that Jackie has quilted---Many of them having a blue ribbon, Best of Show, or some award on them! She is another one of our many talented local educators! June 2017--P3 Designs applique retreats. We are taking names for a backup list currently. E-mail us if you are interested. 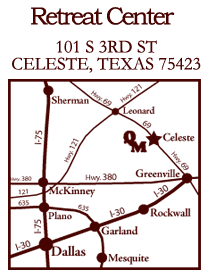 2016 Dates we will be closed: September 3rd, October 29th for Houston Quilt Market, November 20th-28th, December 23rd-January 2nd.